Now Offered in Goleta AND Santa Barbara!! K.O.A.L.A.S. Fitness (Kids. Outstanding. Active. Lively. Adventurous. Strong.) 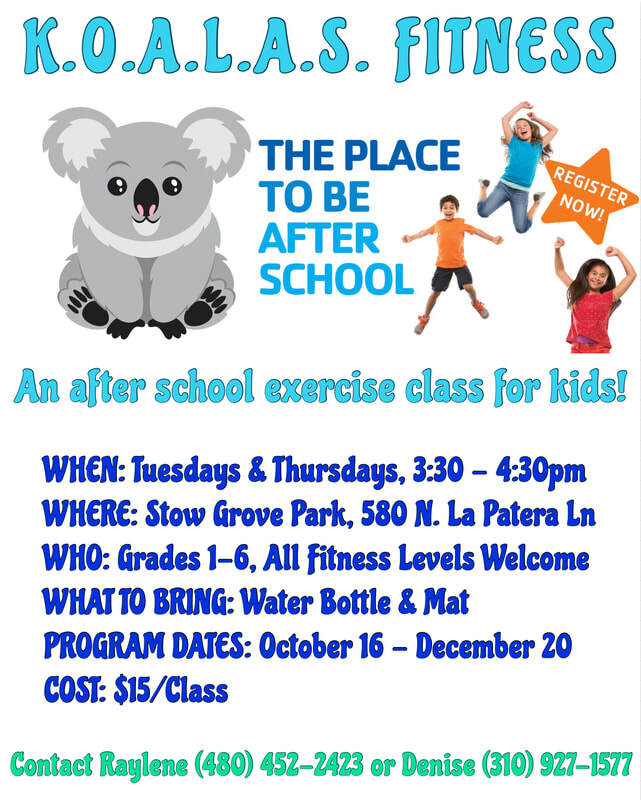 is a new and exciting after school program for youth! ​​Each 1 hour class will consist of a fun yet challenging workout focused on teamwork, leadership skills, sportsmanship, and boosting self-esteem while providing a positive experience that an active lifestyle brings to a young person's life. Workouts will be non-competitive and suitable for all ages and fitness levels regardless of athletic ability. 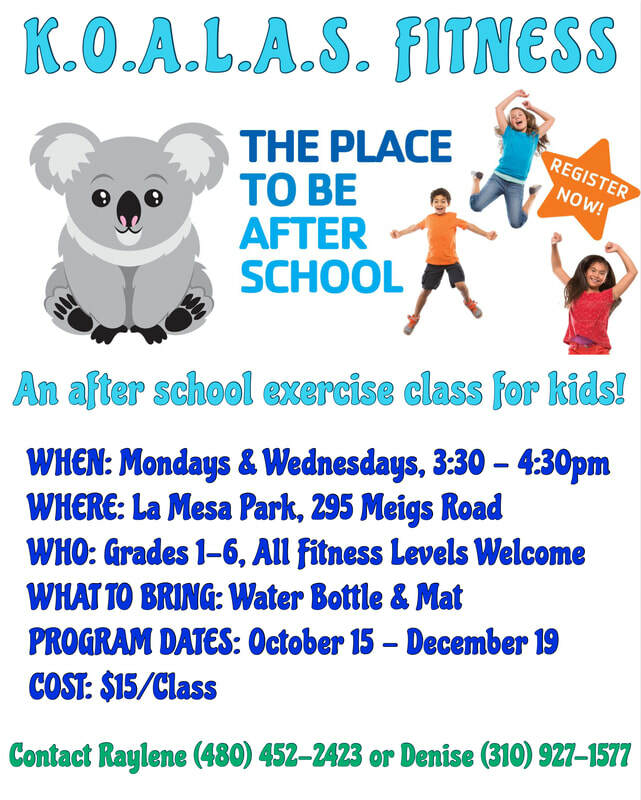 This program aims to motivate and encourage children to move while creating a positive outlook on exercise. The benefits of after school activities for children are wide and varied, ranging from physical benefits due to the promotion of increased activity, to psychological and social advantages. Scientific research proves that encouraging children to engage in activities after school could aid in their development. Experts in child advancement suggest that participation in extracurricular activities on a regular basis is the best way to help children develop their individual personality, cut down on emotional stress, and enhance social or academic skills that could benefit them in the future. Psychologists even recommend after school activities as the preferred choice over confidence-building classes. Every leading study regarding the impact of extracurricular activities on child development shows that academic grades, study habits, and school-based behavior all improve when children attend regular after school clubs and team sports. After all, if a child learns something new in an after school activity, it could boost their understanding of school subjects — even if that activity doesn’t relate directly to classwork. Discovering that they have a talent for something can give children a new source of confidence or passion that translates into their behavior at school. According to research, youths who frequently participate in after school activities are more likely to show greater levels of attention in class, be more engaged in school, and are less likely to develop an inclination for violent or problem behavior. What’s more, some extracurricular activities provide students with the facilities and time to pursue interests that they may not be able to pursue at school. Regardless of whether they’re establishing new relationships, or building upon existing friendships, after school activities provide an ideal environment in which to nurture social skills and confidence. Numerous extracurricular activities work to teach children the value of working as a team to achieve a mutual goal — a skill that will benefit them in their future occupation. Similarly, engaging with new people in a productive environment helps to strengthen independence and confidence in children. The more they explore their abilities within a new environment, the more children can build a sense of their own character, and even develop crucial leadership skills. By working with others outside of a classroom setting, youths begin to learn the value of improvisation, sharing ideas, and offering support to peers in challenging circumstances. After school activities offer a positive environment in which children can grow and thrive when parents are working and unable to make it home for right after school. Many adults today stay at work after the school day has ended. After school activities remove the temptation to sit in front of a television set. What’s more, a number of after school activities promote emotional well being by allowing children to work off excess energy, relax their minds, and overcome the stress associated with school life. While sports help to remove some of the tension that could have built during the day, academic clubs help to reduce the stress associated with preparing for tests by offering extra assistance and support. Finally, children with a regular hobby are are likely to spend less static time glued to a smartphone or screen. Not only does the time spent within a club encourage your child to remain active and away from the sofa, but the interests that they develop during those clubs will prompt them to spend more time practicing skills and pursuing their passions. In fact, the Afterschool Alliance has conducted research into the impact of extracurricular activities on child health, and found that they are essential in promoting a healthier lifestyle. Studies of after school programs have shown that obesity levels are often much lower in program participants, with only 21% of children suffering from weight problems compared to 33% for non-participants. The skills and habits a child learns during his or her school years help to shape the kind of future they will lead as an adult. As a result, after school activities that promote everything from healthy-living habits, to leadership skills, good time-management, and better social or academic performance have plenty of advantages to offer.